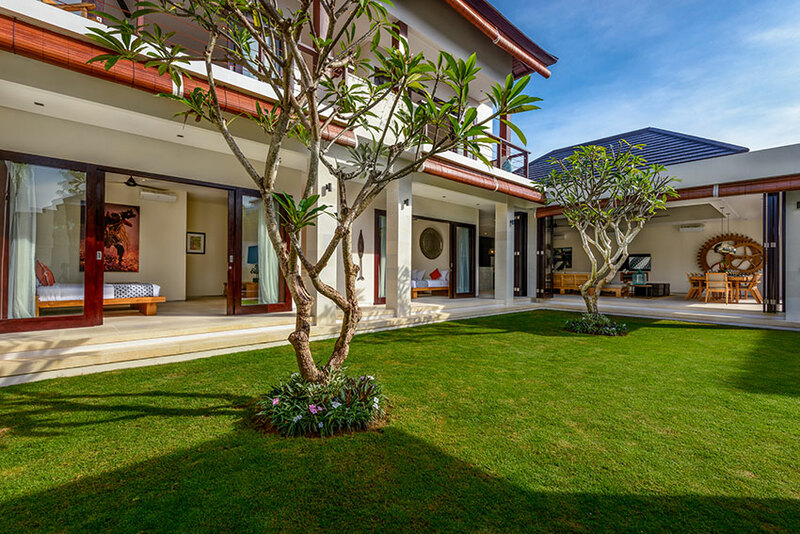 Villa Maya is a stunning,contemporary, two storey family villa, located among the pristine rice paddies near Berawa Beach. 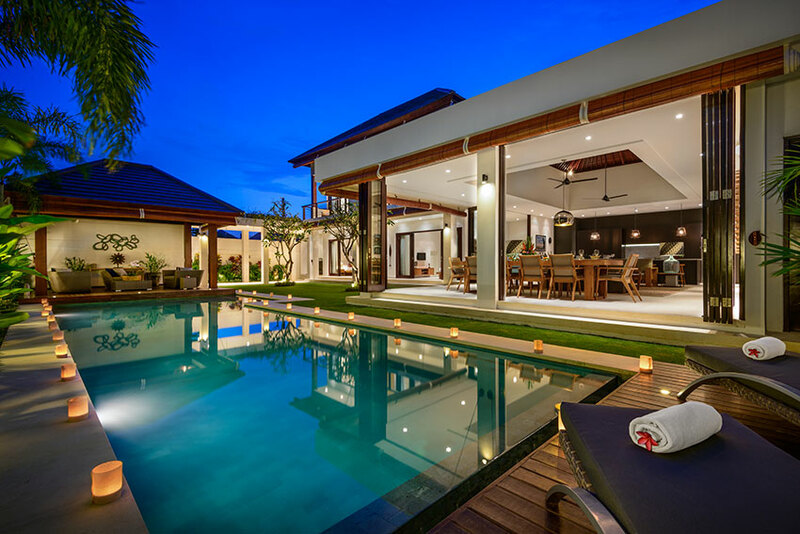 Tucked away behind its modest walls lies a totally private and lavishly well-appointed residence all overlooking a beautifully vibrant and lush tropical garden and sparkling swimming pool. 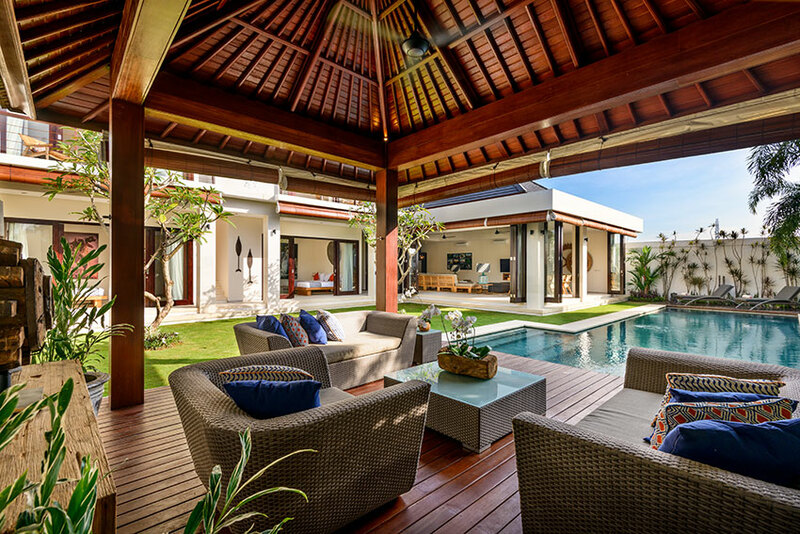 Villa Maya is an impeccably tasteful, modern interpretation of traditional Balinese style and architecture, filled with striking neutral tones, rich locally sourced timber and pristine natural sandstone, boasting four bedrooms with ensuite bathrooms, enclosed living, dining and kitchen, nice gardens, pool and poolside bale. 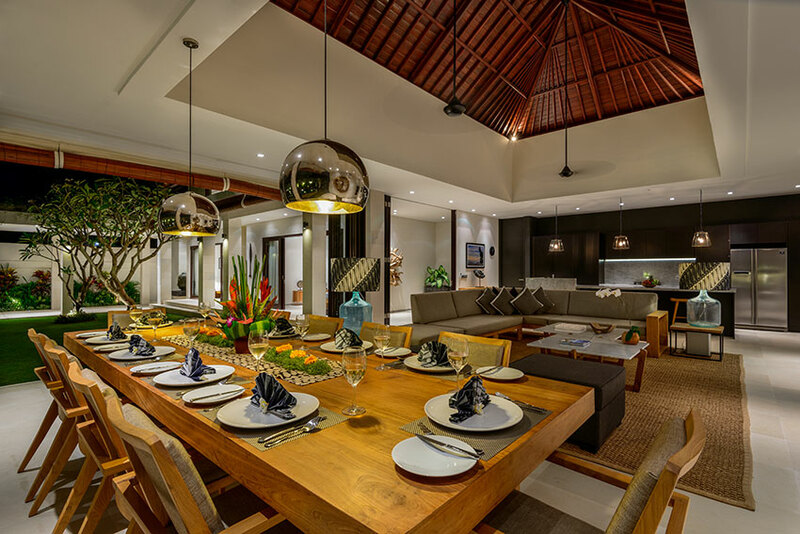 Offering the best of both worlds, The Maya is slightly removed from the tourist masses however only a 15minute drive to bustling Seminyak and a short drive to the sun kissed, Berawa Beach. 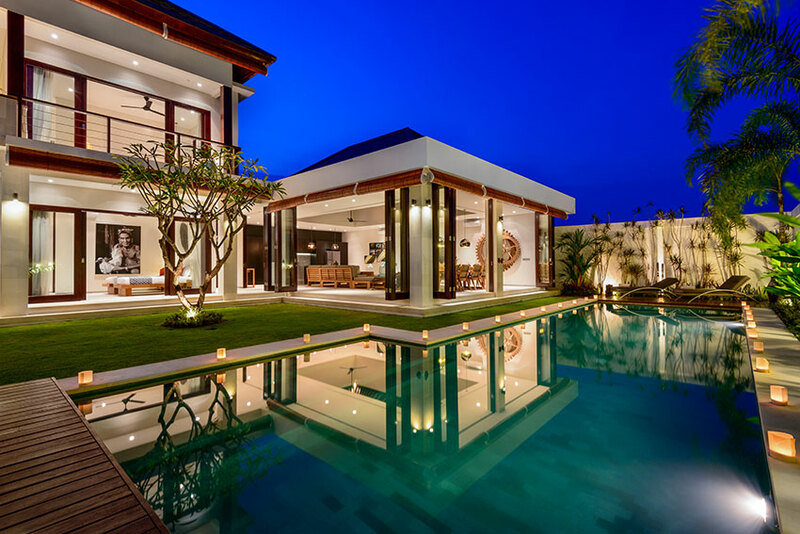 Upon entry guests are immediately dazzled by the scale and grandeur of the villa. Ahead lies a meticulously manicured lawn adorned by two majestic frangipanies leading to a pristine 15 meter salt water swimming pool lined with palm trees.A huge magnificently and crafted timber gazebo overlaps the edge of the pool and accommodates an impressive seven-seater rattan lounge. Ceiling fans and blinds make for a delightfully relaxing all weather outdoor living or entertainment area. Floor to ceiling glass sliding doors surround the large living area, creating a breathtaking open space which is perfectly laid out with an impressive sleek modern kitchen, marble island bench, a massive 9+ seater lounge, 60” flat screen smart TV/DVD, Bluetooth Stereo and an absolutely stunning dining table for 10pax complete with pool and garden view. 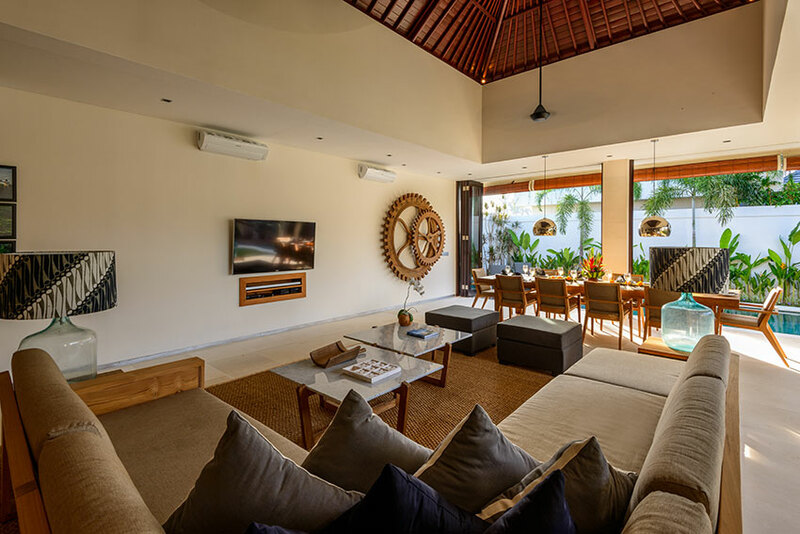 The bifold glass doors create a versatile relaxation area offering alfresco living ora fully air-conditioned environment with the option of ceiling fans with Wi-Fi freely available throughout the villa. 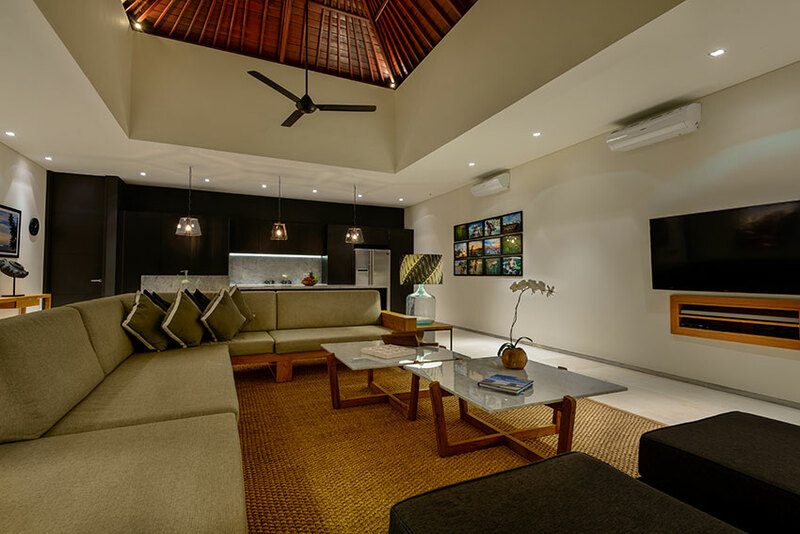 Four bedrooms comfortably sleep 8 guests, but can accommodate upto 10 people. 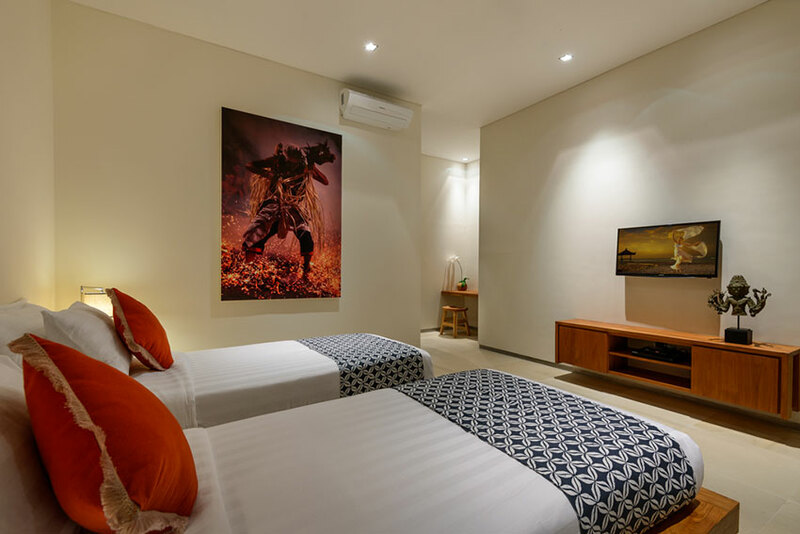 All rooms are beautifully appointed with handcrafted solid timber king size beds (with American spring coil mattresses) and crisp white linens,32” flat screen, smart TV/DVDs, air conditioning, ceiling fans, walk-in wardrobes and his/her bathroom vanities. 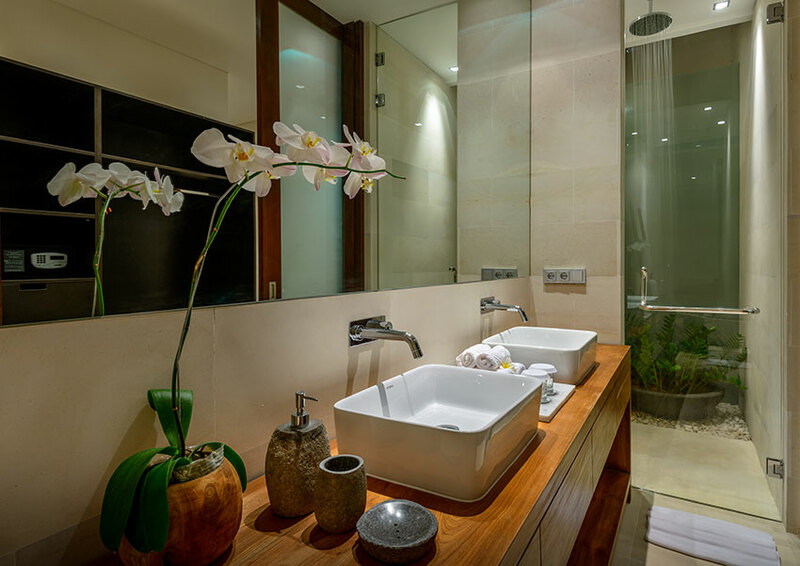 Two bathrooms comprise 2 meter deluxe terazzo baths and all bathrooms have spacious showers with rain shower heads. 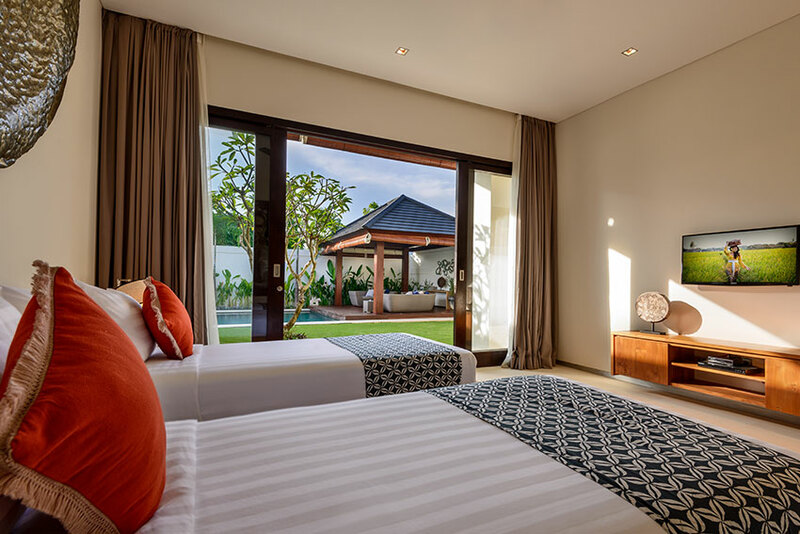 The two ground floor bedrooms have single beds that can convert to king size beds. 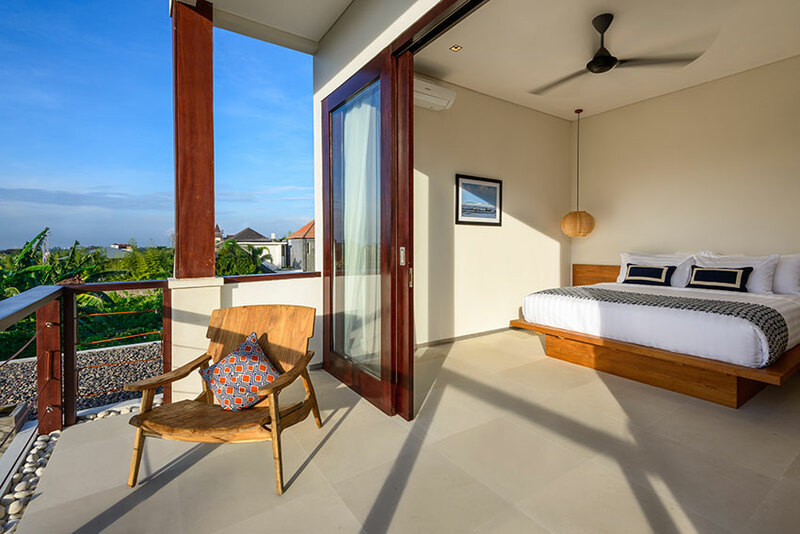 The upstairs bedrooms lend themselves to open views of lush rice fields, and enjoy cooling ocean breezes, whilst the downstairs rooms offer splendid garden and pool views. 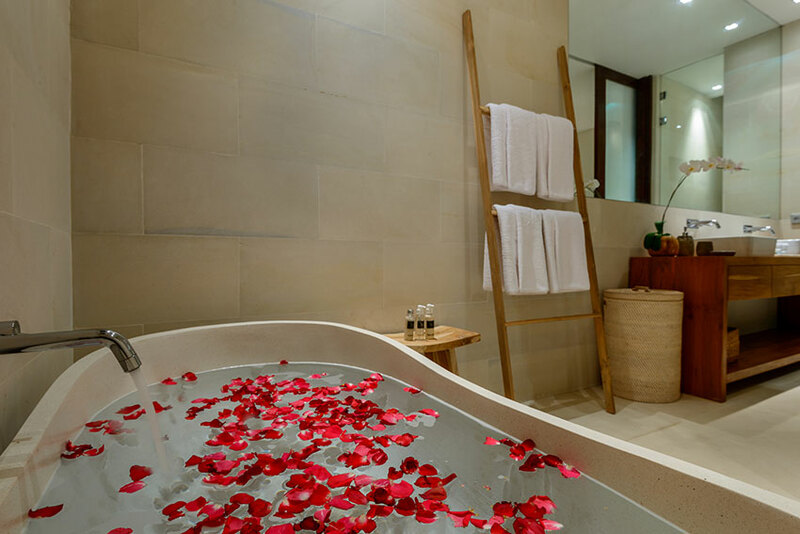 The Maya staff are highly trained and take great pride in ensuring all guests have a pleasant and relaxing stay. 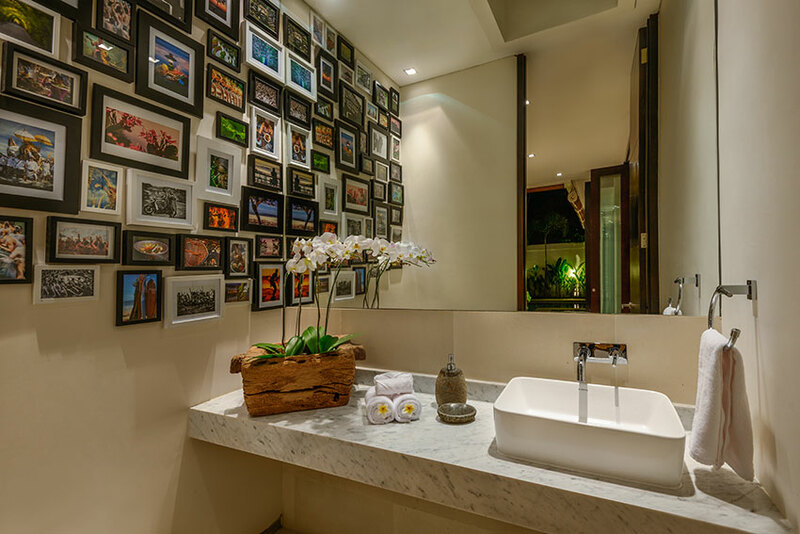 Daily housekeeping staff will ensure the villa is kept impeccable and your very own butler will attend to your every need. 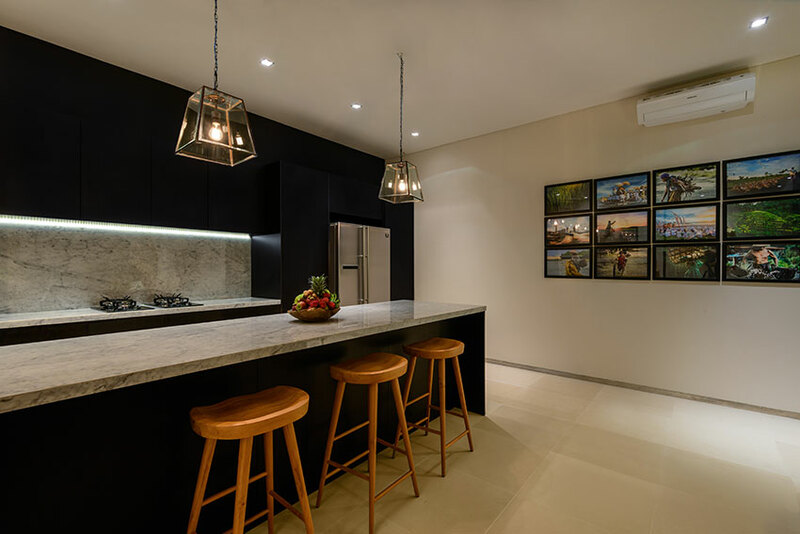 The resident chef will prepare meals throughout the day and can tailor a personalized menu to satisfy your every taste. 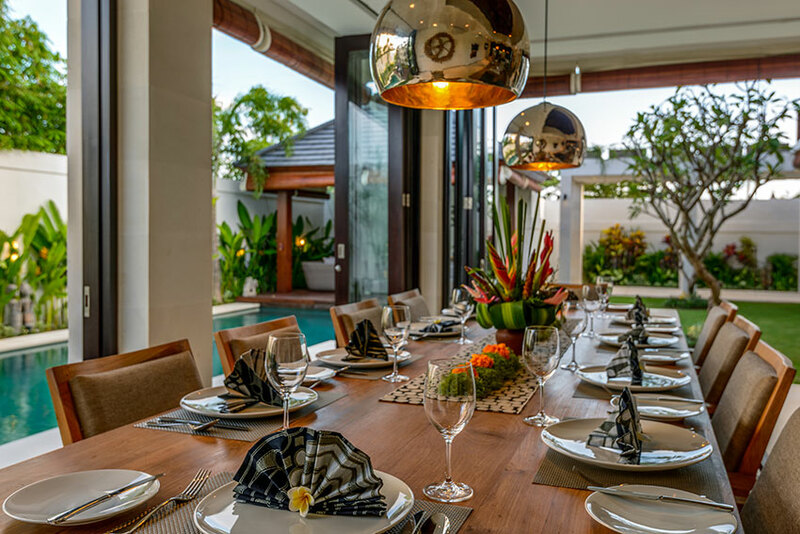 The villa manager will be there to oversee operations during your stay and ensure your Bali holiday is an amazing and unforgettable experience. 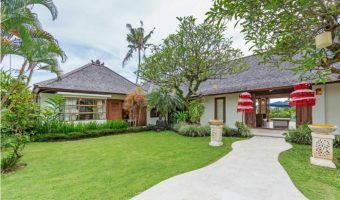 Located on the doorstep of beautiful Berawa Beach, The Maya is also a short stroll from the well renowned Bali Equestrian Centre where the whole family can enjoy the pleasure of horse riding. 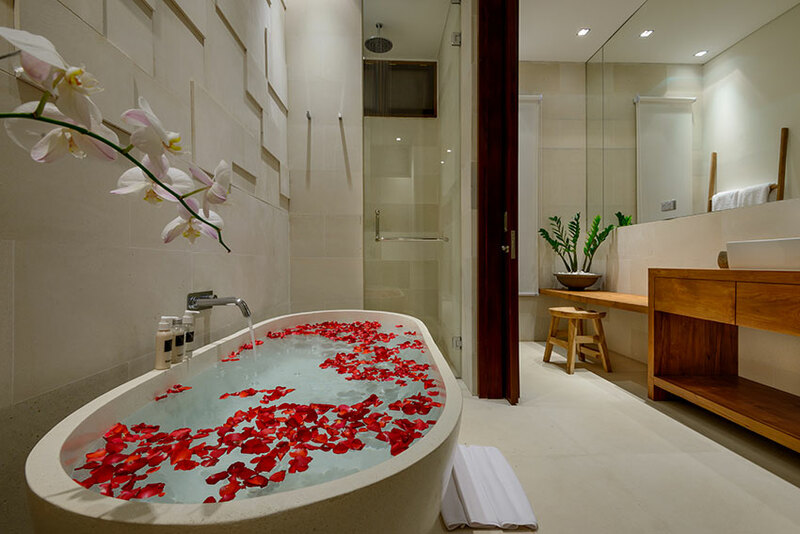 They also run lessons and holidays camps for children, as well having a restaurant, bar and pool that is open to the public. 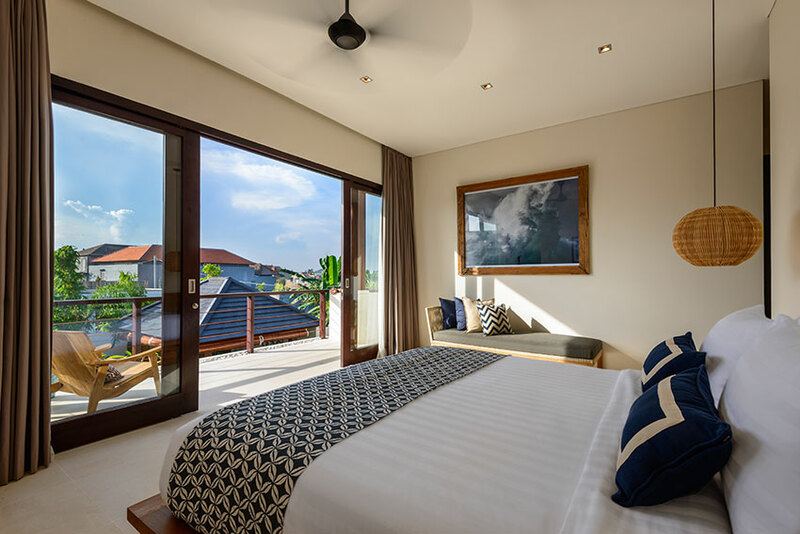 The Maya is just 5minutes from The Canggu Club and its entertainment/sports/leisure facilities including, water slide park, tennis, bounce kids centre, ten pin bowling and a world class gymnasium. 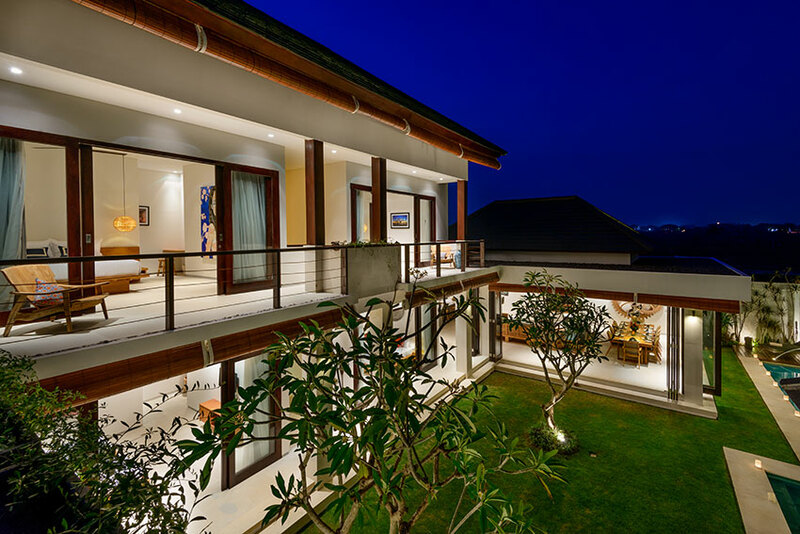 The Maya is only 10minutes from the famous surf break of Echo Beach as well as Berawa Beach, 15minutes from the host of cafes/restaurants/boutiques/night clubs/bars of Seminyak, 20 minutes from the internationally acclaimed Greg Norman designed Pan Pacific Golf Course and only 30minutes from the International Airport.